I transferred the kids out of our district to Arlington schools. 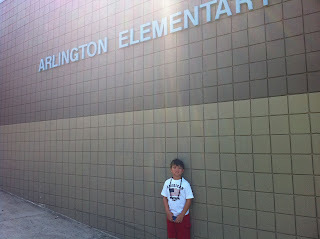 Kyle started 2nd grade at Arlington Elementary and Kaitlyn started 6th grade at Arlington Middle. Kaitlyn decided she wanted to be in the band (which is going to end up costing me a fortune). She is going to play the trumpet (for now at least). She was terrified of going to middle school, not only is it middle school but since I transferred her she would not have the kids from Bartlett that she has been in school with all this time. So far though she loves it. I took this first one on registration day. The first day of school is rough because I have to leave so early but I still want to take their picture (and I can't rely on John to do it). So I get them up early, get them dressed, take their picture, then they go back to bed.